Hanging Wood Address Plaque with Sawtooth Edges - - personalized rustic wood 11.5" x 5.5" rectangle sign with sawtooth edges on the short ends and either one or two address lines engraved into the wood. Made in USA. 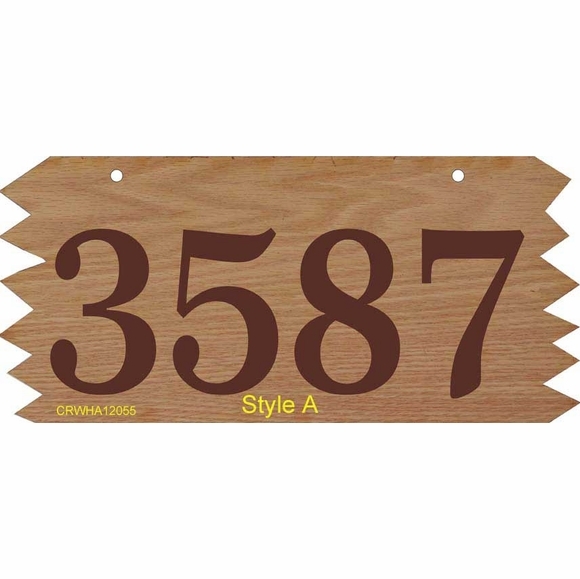 This address plaque can be manufactured as a one sided or a two sided hanging sign. On two sided signs, both sides have the same personalization. Comes with two 1/4" hanging holes 7.5" center to center. Ready to hang from your own bracket. Natural high-quality Red Oak hardwood layers or veneers are laminated together with their grains at 90 degrees to each other for added stiffness and strength. Note: Because wood is a natural product, color variations are common. This product must be coated with a marine-grade varnish before you hang it outdoors. The one-line version holds either four (4) 3.5" characters or five (5) 3" characters. On the two-line version, Line 1 holds ten (10) 1.5" upper and lower case characters as shown, and Line 2 holds four (4) 3" characters. If you are ordering a one-line sign, the maximum number of characters is five. Please leave the rest of the input box empty. The part number you see in the lower left corner on the sample will not be on your sign. Dimensions: 11.5" x 5.5" x 0.25". Before hanging this real wood sign outdoors, please coat it with the varnish! Suitable for outdoor use ONLY when protected with marine-grade varnish.